Do you have a single card or item in your collection that stands out from the rest? It's often not easy to pick one when looking at a collection that you spent plenty of time (and likely money) building. Is picking just one favorite a challenge that you could take on? Tweet @blowoutbuzz on Twitter (or send an email at the address below) for more info on how you can have your favorite card or item highlighted here on The Buzz. We want to see what makes you tick. Why this matters to me: This card, specifically the one that I've shown, is hands down the best card in my collection. This entry was posted in Baseball, Playing Favorites and tagged MLB, New York Mets, Topps, 1985 Topps, Dwight Gooden, 1985 Topps Dwight Gooden on May 17, 2018 by BlowoutBuzz. Why this matters to me: When it comes to collecting players in the modern hobby, there is usually one card that is considered the most desirable and it’s usually the player’s first Bowman Chrome autograph. And if you don’t time it right, the card of your player may cost you more than you’d want to spend. But that's not his story ... keep reading. This entry was posted in Baseball, Playing Favorites and tagged Clayton Kershaw, Los Angeles Dodgers, MLB, Topps, 2006 Bowman Draft, Ben Aguirre on May 14, 2018 by BlowoutBuzz. Collects: I collect Rookie Cards of modern stars as well as autographs of Hall of Fame players. Why this matters to me: Neither of my parents are sports fans, but they encouraged reading and first bought me a baseball history book when I first expressed interest in the sport. It was the perfect gift to learn about the game that would become my greatest passion in life. Babe Ruth was clearly a larger-than-life figure, and, even as a kid that was born 100 years after his birth, I felt this sense of awe when learning of his accomplishments. When I moved into collecting, I truly felt a genuine connection when owning an autograph of a player. It's like I have a personal slither of history and greatness. Unless you are an avid autograph collector, it is difficult to articulate just how connected you can feel to an individual that you have never met through something as simple as an autograph. The simplicity behind an autograph is what truly makes it beautiful. A brief moment in time occurred where an athlete writes his name on an item, but a historical event takes place in my eyes. For a fleeting moment, an individual who has reached the pinnacle of athletic achievement has held the item that is now yours, and permanently left a reminder of their greatness for years to come. This entry was posted in Autograph Collecting, Baseball, Playing Favorites and tagged Babe Ruth, MLB, New York Yankees, Babe Ruth autograph, Perez Steele on May 11, 2018 by BlowoutBuzz. Why this matters to me: I believe I have the largest collection of Oakland A's cards as well as Yoenis Cespedes (A's only). If I don't, I'd love to meet the individual that does. This card is the crown jewel of both my A's and Cespedes personal collection. I was collecting every Cespedes card I could get my hands on from 2012 to 2014. The Five Star Silver Signature Series was an amazing card (with parallels) and it was one of the first rainbows I attempted to complete. It's not my most expensive card, but it's definitely my favorite. This entry was posted in Baseball, Playing Favorites and tagged MLB, Topps, Yoenis Cespedes, 2013 Topps Five Star, Oakland A's, Benjamin Wilson on May 7, 2018 by BlowoutBuzz. Why this matters to me: "Aesthetically speaking, this is more of a work of art than a baseball card. It is completely made of wood, inside of a wood frame, gold-ink signature, gold holo-foil and an awesome picture. ... The wood card is among the most beautiful cards made of Canseco in my opinion, but the entire rainbow is incredible as well. The /5 could have easily made a sweet 1/1, as it is simply gorgeous with its anodized black frame, silver ink and silver holo-foil. The wood card however, absolutely deserves its 1/1 status." This one's not that simple ... keep reading for more of his story about this card. This entry was posted in Baseball, Playing Favorites and tagged MLB, Topps, 2017 Topps Museum Collection, Jose Canseco, Tanner Jones, 2017 Topps Museum Collection Framed Autographs Wood on May 2, 2018 by BlowoutBuzz. What's Buzzing Today: Big wrestling pulls, more 1990s NBA box breaks, favorite Panini NBA releases and ... what if the Golden State Warriors lose? This entry was posted in Basketball, Board Buzz, Pro Wrestling and tagged 2016 Topps WWE, Golden State Warriors, NBA, Panini America, 1990s NBA box breaks, 2016 Leaf Signature Series wrestling, Andre The Giant, Steph Curry on May 29, 2016 by BlowoutBuzz. Have you seen the latest cool cards from a new release? With so many options for collectors of all kinds arriving every week it's possible you haven't. That's where Buzz comes in -- well at least on one brand you'll see here from time to time in what we're calling Buzz's Pick Six. Simply put, here are six cards from a new arrival that seemed interesting to this collector and we think they might interest you, too. Why it’s Buzz-worthy: This fine feathered friend of baseball has had a place in Donruss packs since the early 1980s and this new set includes the latest in fowl ballcards. This particular six-piece looks to include a couple wings, a thigh and three jersey swatches plus the autograph from the man behind the beak, who has been signing meticulously for years despite having one of the longest names in cardboard history. I grabbed one of his memorabilia cards in recent years but these are always worth a look. 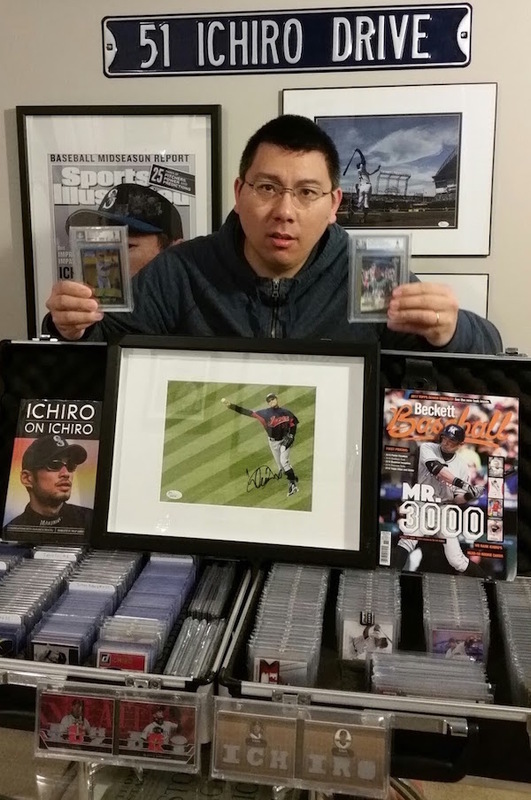 This entry was posted in Baseball, Buzz's Pick Six and tagged Buster Posey, Ichiro Suzuki, Panini America, Vladimir Guerrero Jr., Ted Giannoulas, The San Diego Chicken, Ronald Acuña Jr., 2019 Donruss, 2019 Donruss Recollection Collection, 2004 Donruss Studio, 2019 Donruss Action All-Stars, 2019 Donruss Elite Series, 2019 Donruss Rated Prospect Material Signatures, 2019 Donruss Franchise Futures Pink Firework, Domingo Ayala, 2019 Donruss Sensational Signatures on March 28, 2019 by BlowoutBuzz. The Raiders marched down the field late in the fourth to take a lead and survive 35-34 thanks to a missed field goal form the Saints, but Carr's 24-for-38 day with 319 yards passing and a touchdown -- as well as Amari Cooper's six-catch 137-yard day -- should give collectors hope. Some lesser-known names got the scores on Sunday (Perhaps Panini Instant will be the first home for a Jalen Richard Rookie Card after his first carry went for a 75-yard TD?) 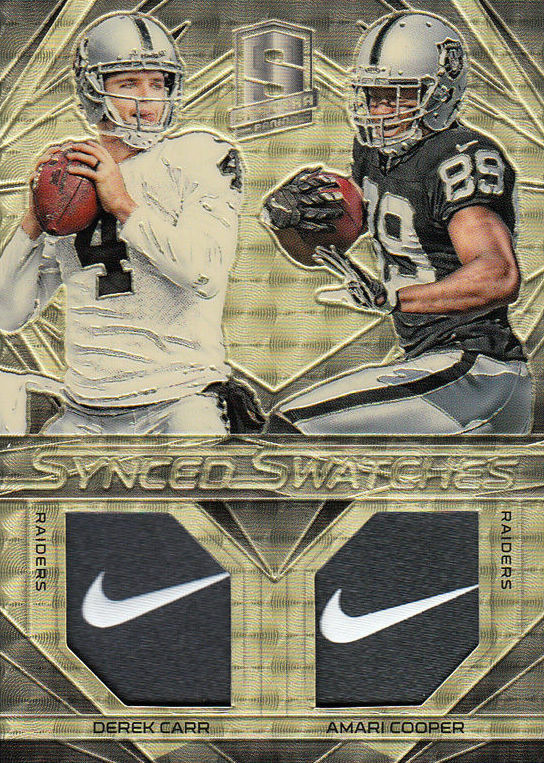 but these two collector favorites will likely get the attention if this is the Raiders' year to rebound well. This entry was posted in Football, Sunday Superstars and tagged A.J. Green, Adrian Peterson, Amari Cooper, Andrew Luck, Derek Carr, Drew Brees, Ezekiel Elliott, Jameis Winston, NFL, Panini America, Brandin Cooks, Carson Wentz, Dak Prescott, Jalen Richard, Spencer Ware, Will Fuller, Willie Snead on September 11, 2016 by BlowoutBuzz. The recent Ken Stabler Career Collection sale via Pristine Auction was one on my collecting radar from the second it was teased and on my mind until the final gavel came down earlier this month. Simply put, I had to have something. Why? Stabler wasn't the first NFL player I ever met -- he was probably the second -- and I had his autograph a dozen times from various appearances where I played autograph hound in the past, but I knew I had met someone unique every time I ran into him. I knew that the MVP awards and the game-used items would be out of my reach. I knew that the game balls would be scooped up by serious collectors just like many of the odd mementos in the auction that included everything from wedding photos to belt buckles, cowboy hats and mix tapes. But I knew I had to have something. This entry was posted in Auction Buzz, Football and tagged Alabama Crimson Tide, Alabama football, NFL, 1973 Topps, Alabama, Houston Oilers, Ken Stabler, Ken Stabler Career Collection, New Orleans Saints, Oakland Raiders, Pristine Auction on August 30, 2016 by BlowoutBuzz. The 2019 Bowman checklist is here. Click above to view it and more on this year's release. Among the monthly features here on The Buzz is Making The Grade. See what Buzz graded or picked up in a slab at the link above. We want your Panini Rewards points. Get the details above. A new section on The Buzz is Pick Six where Buzz spotlights six cards from a new or recent release. Collecting Game-used is an occasional feature where Buzz talks about memorabilia ... check it out. Buzz Buys is a new feature where Buzz shows off a few new additions and explains why he likes them. We're offering big rewards for hobby gems with Blowout's Most Wanted. Follow Buzz on Twitter for a lot more collecting chatter. Click above to see all new football items here on The Buzz. Click above to find eBay Buzz where we spotlight big and interesting items every week. Like pack and box breaks? Check out our #Buzz8in8 marathons each month. Among the features here on The Buzz is Playing Favorites. Can you pick just one card or item from your collection as the best? Is your redemption card now live? Check the updated Redemption Roundup by clicking above. What If ... The Rock had new Miami football cards from Panini? Want a deeper dive into someone's collection? Check out our past Buzz Collector Profiles. Check out all of our items with Shohei Ohtani mentioned right here. Research boxes before you buy -- check out the Buzz Breaks section. See the newest UFC stuff from Topps' lineup. Click above for the newest NBA items from Panini America's portfolio. Note: Retail/blaster boxes typically arrive one week after posted hobby date. Check the main release calendar page for those details and a longer-range list.